High Strength Glucosamine Sulphate 500mg + Chondroitin 400mg plus Vitamin C 60mg is in each tablet. Chondroitin is a substance that occurs naturally in the connective tissues of people and animals. As a supplement in higher doses than is found naturally, chondroitin is a popular treatment for Osteoarthritis. Chondroitin sulphate chains bind to hyaluronic acid to form a ‘springy’ molecule that increases the strength and elasticity of cartilage, making it more resilient. 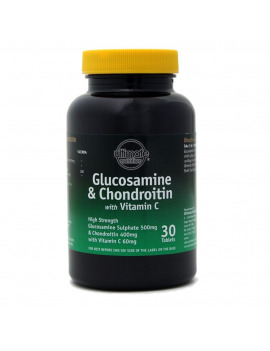 Chondroitin sulphate also has beneficial effects on the metabolism of joint cells. It acts as a signal to inhibit the enzymes responsible for breaking down cartilage and increases type II collagen (*) synthesis. Most people start to feel results in 4-6 weeks with using this supplement. Cumulative benefits are achieved through long-term daily use. The cause of wear on the joint area can be linked to insufficient lubrication and cell membrane fluidity. Chondroitin occurs naturally in animal tissue, especially connective tissues. Gristle on animal bones is high in chondroitin. However, these sources are much lower than the doses provided in Chondroitin supplements. 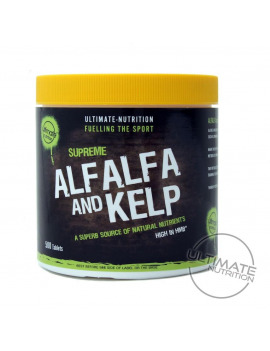 (*) Ultimate Nutrition's Pure Marine Collagen is type 2 and may considerably benefit people that suffer with arthritis, joint problems and bone problems casued through a sporting injury. Take 1- 2 tablets per day, with or without food at any time of the day. For the maximum benefit take 4(**) tablets daily. Can be taken at any time of the day, with or without food. (**) Taking 4 tablets daily, provides 1500mg of Glucosamine as recommended by Doctors. that is why you need to take four tablets per day of Ultimate Nutrition's Glucosamine with Chondroitin. (**) Recommended as per the trial performed in a hospital over a three year period. If you would like a copy of this report, please contact us with your request for The Lancet Report. Glucosamine Sulphate, Chondroitin Sulphate, Vitamin C (Ascorbic Acid). 2. Glucosamine is derived from fish shells.